The term "basic" is used loosely here, as this MIDI library includes time signatures 3/4, 4/4, 5/4, 6/4 and 7/4. You get over 750 MIDI files in different playing styles with lots of variations (ride, bell, closed and open hihats, tomtom grooves, fills and longer jams). 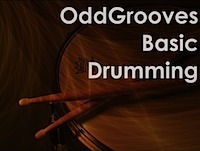 The grooves are arranged for Toontrack EZ Drummer/Superior Drummer and General MIDI.